I was given the Lonely Planet Cycling Australia Guide as a gift for my birthday. I thought I should do a bit of a review on it for those who might be interested in purchasing or who require a bit of inspiration on cycle tour destinations. The book is geared toward road touring, where carrying camping gear and food is optional. Perfect for my kind of touring. But due to these limitations, the book is focused around the Australian seaboard where towns and sealed roads are plentiful. Whilst they do make mention of the outback routes, even giving them a bit of a description, they warn that these are not undertakings to be taken lightly, offering some general notes about routes and what you might encounter. Like most of the other Lonely Planet books, this book is made up of the usual sections. So if you are familiar with the other Lonely Planet books, this will feel right at home. The usual where to stay, places to eat, places to visit sections are all present as well as some new sections about places to hire a bike, places to buy bike supplies, cycling events on during the year and places to mountain bike. 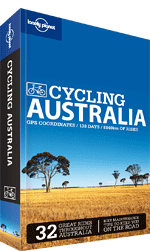 Before we get in to the cycle tour details, the book contains the usual Lonely Planet stuff about money, planning a trip, wildlife, weather and general information about Australia. In this section is a useful gear list as well as some etiquette type rules around riding. Each state (except NT, ACT is with NSW) has it’s own section which is made up of between 2 and 7 cycle tours inside the state. Rides vary from a half day jaunt around a capital city to a 10 day partial circumnavigation of Tasmania. Most rides seem perfect for a weekend or long weekend trip falling around the 2-3 day mark. Each ride is also categorised in to a difficulty level, taking in to account road surface, amount of riding per day required, difficultly of said riding (hills and the like) and navigational challenges. So down to the actual rides. Each ride has a quick summary containing a general description, what time of the year to go, special equipment to bring, where to go for maps, where to go for more information, how to get to the start and finish locations. A map of the whole route usually follows. They then give a detailed description of each day of the tour with road descriptions, cool stuff to do and see, places to stop on the way then a cue sheet with road names and GPS co-ordinates. The cue sheet has a variety of symbols indicating turns to be made, hazardous sections, hills, traffic lights, towns and points of interest, nice side trips on the way. Once reading the description, you could probably just photocopy these cue sheets and use them to navigate on the day. For most days but not all, an elevation profile is provided. I have previously done a tour similar to one in the book. It gave the route we had taken a fair description and pointed out some of the good things to do on the way. Obviously, things are changed or missed or aren’t important to some people so it is worthwhile to do your own research. The back section has a directory which has general discussion on what to expect on topics like accommodation, what to do with your kids, safety, big cycling festivals and events (although they missed off Cycle QLD! for shame!) and a variety of other travel related topics (money, embassies, internet). There is then a section on travel and getting around which outlines the various methods of transportation available and health including a training program and stretches and the weird and wonderful diseases and bitey creatures in Australia. Again, mostly what you’d find in any Lonely Planet Guide. But a new cycling specific feature is a 20 page section on your bike. It includes sections on choosing a bike, setting up your bike, packing your panniers/luggage as well as some basic bike troubleshooting and maintenance tasks. A nice addition, I think, as the information is, not doubt, useful. If you are looking to get in to cycle touring, need a bit of inspiration and a gentle helping hand, this would be a great book for you. The language is plain and straight forward so would be suitable for overseas visitors and those whose first language is not english. If you are already a seasoned cycle tourist, there is probably not a lot here you don’t already know but it does offer some nice looking routes. The book is about the size of a paperback novel and contains some glossy pictures. I probably wouldn’t take the whole book on a single tour, rather photocopy the relevant sections and save the weight. But if you were going on an extended tour and wanted to link them up, maybe taking the book would be better for you. Personally, I can’t wait to get out there and try some of these tours!